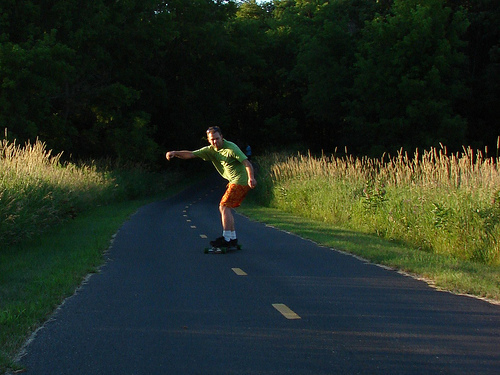 One of my favorite things to do on a beautiful day is to go on a “Nature Skate.” This consists of longboard skating through forests, plains , and wetlands- the Three Rivers Park District has several nearby parks that feature miles of smooth rolling paths. 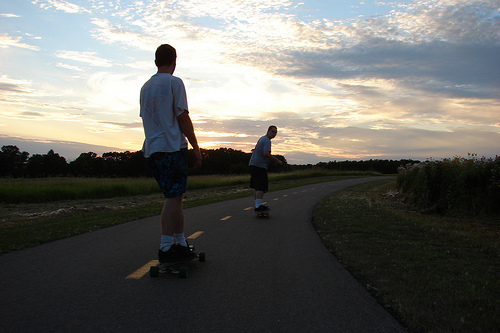 The type of longboarding I have gotten into is called “pumping” – basically, gyrating rhythmically back and forth such that forward momentum is created, and sustained. When you’re really in the groove, you can propel that big damn skateboard up hills, without touching a foot to the ground – and you can get whizzing along nicely on flats … or FLY down hills. It’s incredibly satisfying. Anyway, this habit is what led to my being highasakite in the woods on a skateboard with a bunch of my friends, some on boards and some on bikes. We were cruising through the nearest skateable park reserve, down in Bloomington. Having rounded the far end of the park, we were heading back and I was at the head of the pack, which tends to happen – I have been doing this longer than most of my friends, and my board is a dedicated pumping board, optimized for this kind of riding. I hit the next intersection – this is where I need to either wait, or turn back – because if I just skate off in some direction, the people back there somewhere on the trail won’t know which way I went and we’ll get split up. So I roll into the grass to stop and wait … but then I change my mind. I don’t want to wait, I want to skate. Skate no wait. So I take off solo, liberated – I can go where I want at my own clip and I”m not responsible for anyone else – the others know where the car is and how to get there, one way or another – it’s not a very complicated park, and there are maps on the major intersections. So I’m gone. It was easy, and no big deal – but it was the first time that I’ve ever just left them behind. When I fly down the last nice hill and survive the transition down the curb into the parking lot, I’m not surprised that no one else is back yet – but I am surprised to discover that I don’t have my car keys. The only thing in my pockets is a plastic baggie dusted with green crumbs and THC crystals, emptied by the group’s voracious lungs during the ride. Oh yeah, I remember – no keys because Emilie, somewhere out there on a BMX bike, is holding them for me in her backpack. So I cruise around the lot a bit to cool down, and stretch out, and contemplate the varied wildflowers and weeds and shrubs and such growing along the edge of the lot, and ponder the idea of a website that sells native seed mix packets, each mix from a specific national park or other scenic locale. Man, my friends were really taking their time … I hope no one got hurt, and that they didn’t get lost somehow. The low golden beams of the setting sun turned every single tiny piece of traveling pollen into a speck of windborne light. Hmm, getting dark. Sometimes the park police drive through the parking lots at dusk – maybe they’ll come in and wonder why I’m lurking around the parking lot looking shady. I am far from one who gets paranoid about getting busted when I smoke (if anything I err on the side of being too casual and open with it) – but for whatever reason it occurs to me that I might ditch the empty weed baggie I have in my shorts pocket. At first it’s not even quite conscious in my head – just an inkling that starts me moving without thought. Seeing no garbage can around, I take a step toward the foliage, then realize what I am doing and remember I was feeling all in tune with nature and respectful of the plantlife – probably shoving a plastic baggie into the leaves isn’t really congruent with all that jazz. Wait, why the hell am I ditching the bag? I don’t feel nervous or paranoid. And even if the park cops came through, I knew that all they’d do is tell me that the park closes at dark. Nonetheless, I still feel the urge to ditch it, so I stuff the baggie up into the space beneath my car door handle. When the police truck rolls up to me a minute or two later, I’m not surprised. And when he asks me a bunch of questions and then asks if he can search me, I can’t help but smile – sure you can. I was waiting for this, you see, so please – be my guest. After awhile, the park cop – a geeky, wanna-be-military-looking kid – finally goes away, visibly disappointed. Several minues later, my friends finally roll up, with a tale to tell. It turns out that they had all gotten stopped by two park cop trucks a couple of minutes after I’d skated away – apparently some square on the trail had smelled smoke and called in the not-yet-legal-in-this-state fire to the police. The cops had also asked to search my friends – several of whom were holding beers and herbal paraphernalia. Most knew to say no, but one friend, unfamiliar with the ways of the law, granted them permission to search … even though he was in fact holding my gorgeous tiger-in-a-vortex glass pipe, a years-ago gift from my friend Jacque. So he got a ticket, and they got my pipe. Which sucked, sure – but the sting was taken away by the strange luck of being struck by the two uncharacteristic, novel urges – first skating away alone and then hiding the baggie, and thus enjoying a lovely solo ride and being spared a lot of annoying grief. They were so serious! Vehicle convergence coordination and everything. I bet that dude thought he might have found a path to promotion when he got that call. I think we foiled him, regardless of my slip. Lessons were learned, and fun was had. A fun tale to tell. Great story – and help was at hand – sounds am interesting day! Not quite up there with intuitively avoiding getting on board the Titanic as you recently blogged about Mike, but still one of those ‘magical moments that brighten our days’!